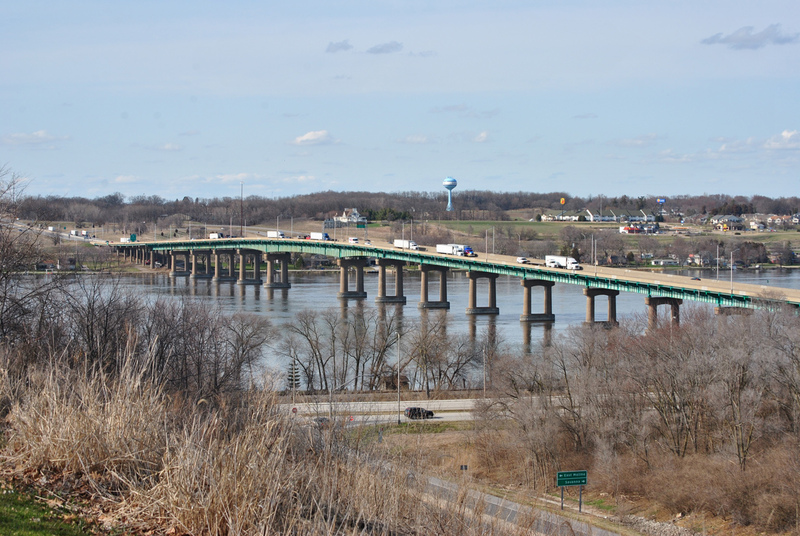 The Fred Schwengel Memorial Bridge carries four lanes of Interstate 80 across the Mississippi River between LeClaire, Iowa and Rapids City, Illinois. The steel girder bridge totals 3,483 feet in length and opened on October 27, 1966. Photo taken April 8, 2013. Interstate 80 crosses Illinois as part of a transcontinental route between San Francisco, California and the New York City area. The freeway traverses 163.52 miles across the Land of Lincoln, including a short stretch along the tolled Tri-State Tollway. Outside of Chicagoland, I-80 mostly travels across open farm land, with smaller cities and villages along the way. The Kingery Expressway, which consists of Interstate 80 east from the Tri-State Tollway to the Frank Borman Expressway in Indiana, was the first portion of the route opened to traffic in 1950. The Tri-State Tollway tied into the Kingery from the west when it opened in 1958. The remainder of Interstate 80 in Illinois was constructed in the 1960s. A scenic view of the Mississippi River is afforded to Interstate 80 eastbound travelers at the Illinois Welcome Center just west of Rapids City. Photo taken 09/04/05.